This is the last ODE (Open Dynamics Engine) tutorial. Thank you very much for reading so far. The last tutorial explains how to make an interactive simulation. You can use a keyboard to control objects in ODE. To realize that you have to make a command function which defines keys how to control objects. The following sample code show the command function. 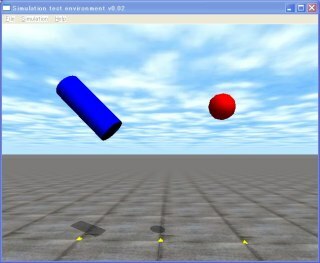 You can add force to objects and restart the simulation. The command function processes the key inputs. The command function realizes an interactive simulation. In this case, the ‘s’, ‘ j’ , ‘k’ , ‘ l’ keys add force the cylinder geometry. If the ‘r’ key is pressed, then restart a simulation. However, if you want to restart the simulation, you must do some necessary processes. In the sample program, to simplify, destroy the body and the geometry and rebirth them. Reset the position and posture of bodies. Reset the velocity and angular velocity of the bodies. If you control joints, reset the target velocity and the torque. The source code, sample15.cpp, can be downloaded from here. Please download and enjoy it . Thank you very much again for reading this ODE tutorials.